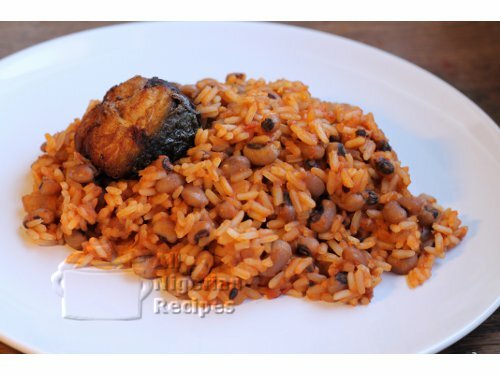 If you do not like beans when it is cooked alone like in Beans Porridge, then you need to try the rice and beans recipe. Wash and soak the beans for about 5 hours. Discard the water and rinse the beans. Put the beans in a pot, pour some water and set to boil. Once the beans starts boiling, turn off the heat, throw away the water and wash again. These steps will help minimize the indigestion associated with beans for most people. Prepare the tomato stew. Visit the Tomato Stew page for details on how to do that. Parboil the rice using the method detailed in Parboiling Rice for Cooking Rice and Beans. Meanwhile, cook the chicken till tender with the chopped onions, thyme and stock cubes. If you will rather use fish, boil the fish for 5 minutes using the same amount of seasoning. Fry or grill the chicken or the fish and set aside. Cook the beans till tender and set aside. Pour the chicken/fish stock into a pot big enough to accommodate the rice and beans, bearing in mind that the rice will rise some more. Add the tomato stew, the parboiled rice and the cooked beans. Check that the water level is just less than the level of the rice and beans. Stir, cover the pot and cook at low to medium heat till the water is dry.